A MATE with a big family is doing something a little out of the ordinary this Christmas, with the festive lunch being a couple of roast legs of lamb and an oven-load of baked vegies and home-made mint sauce to go with them. He reckons there could be nothing "more Aussie," and with it he's serving a 2008 Westend Richland Cabernet Sauvignon – which is a good choice because this wine goes really well with lamb, and is one of Westend's biggest sellers both here and internationally. And better still, it's just a miserly $10.99 a bottle – probably little wonder it helped Westend Wines win this year's NSW Exporter of the Year Award, a nice accolade for a Riverina company that began exporting in 1998 with just 400 cases, and this year selling over 260,000 cases internationally. 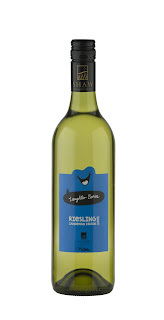 IF opting instead for seafood this Christmas and you're looking for a good Riesling to go with it, think about a case of Shaw Vineyard Estate 2009 Laughter Series Riesling – you'll be doing yourself a favour, and kids suffering from cancer as well. AN interesting trio of sparklings for Christmas is the new Si (pronounced Sigh) range at just $17.99 each at BWS, Woolworths Liquor and Dan Murphys. The Sparkling Sauvignon Blanc NV is ideal with prawns, shellfish and oysters, the Sparkling Pinot Gris NV with deep sea fish such as tuna, kingfish and mackerel (or creamy mushroom pasta dishes,) and the Sparkling Moscato NV with lobster or crab or fruity desserts. Or enjoy them all with a cheese platter. "Jeannie Cho Lee, the First Asian Master of Wine, to Tour the Region with Award Winning Book - Asian Palate"
(HONG KONG, December 10, 2009) – Celebrated wine aficionado and the first Asian Master of Wine, Jeannie Cho Lee, will embark on a tour of Asia with a programme of high profile food & wine events starting in the New Year. Jeannie will share first-hand the findings of her award winning book, 'Asian Palate' which is a guide to the increasingly prominent role of wine in Asian dining. The official book tour, which is scheduled for January and February 2010, will visit nearly every city explored in the book. In each of the cities, the events will be hosted at a Hyatt Hotel & Resort property which will include a press cocktail as well as an evening of fine dining with local specialties prepared by renowned chefs and paired with wines. Confirmed dates are the Grand Hyatt Hong Kong (January 15), Park Hyatt Seoul (January 22), Grand Hyatt Bangkok (January 26-27), Park Hyatt Beijing (January 28), Park Hyatt Shanghai (January 30) and Grand Hyatt Singapore (February 26). Firm dates from other cities such as Mumbai, Tokyo and Taipei will be confirmed over the next few weeks. 'Asian Palate' is a unique, lavishly illustrated, coffee table guide to wine and Asian cuisine, which was launched last month at the Hong Kong International Wine and Spirits Fair. Since then 'Asian Palate' has been shortlisted for the 2009 André Simon Food and Drink Book Awards and received the Gourmand World Cookbook Award 2009 for Hong Kong. The book takes an insightful and informative look at the historical influences and development of Asia's diverse cuisines and how wine can best complement distinctive flavours of familiar local dishes, highlighting how local spices, ingredients and cooking methods impact on wine. Pairing suggestions range from informal, family style meals to formal banquets. "The tour is an opportunity to introduce food and wine lovers to a new taste sensation pairing local Asian flavours with wine," Jeannie said. "The experience includes a fine dining evening with authentic local flavours and fine wines." Born in Seoul, Jeannie Cho Lee is the first Asian to be awarded the coveted title 'Master of Wine', an elite group of just 278 in the world acknowledged by the prestigious Institute of Masters of Wine in London. One of Asia's pre-eminent authorities on wine, Jeannie is a columnist for a number of renowned wine magazines and is a wine consultant to Singapore Airlines. Her work as an international wine judge, speaker, journalist and educator has led to extensive travels through Europe and North America and in 2009 she was awarded the Vinitaly International Award for her contributions to the wine industry. "Asian Palate is the result of years of research and offers a new perspective on pairing wine with Asian food that takes into consideration factors unique to the Asian table such as strong condiments and spices, communal dining and a very wide range of flavours. In many parts of Asia, pairing wine with Asian cuisine is a new area of discovery," Jeannie added. 'Asian Palate' is the first of a two-part series to include 'Mastering Wine at the Asian Table', focusing on mastering the language of wine from both Asian and traditional Western perspectives, understanding major grape varieties and wine regions, and including the views of prominent Asian wine collectors. Sponsors for the book tour currently confirmed include Hyatt Hotels & Resorts, Chateau Palmer (Bordeaux), Maison Joseph Drouhin (Burgundy), Domaine Jacques Prieur (Burgundy), Pol Roger (Champagne), Moet Hennessey (Champagne), Paul Jaboulet/ Domaine Thalabert (Rhone Valley), Shaw & Smith (Australia), Domaine Weingut Heymann-Lowenstein (Germany), Jacques Lurton (Loire Valley), Grace Vineyard (China), Grace Winery (Japan), Sula Vineyards (India) and Siam Winery (Thailand). 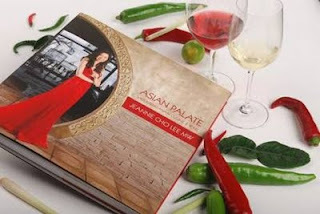 'Asian Palate' is priced at US$98, available to order from Asset Publishing and Research Limited, Hong Kong +852 2573 6078, books@theasset.com, through http://www.amazon.com and from Watson's Wine Cellar stores and selected fine book stores in Hong Kong including Dymocks and Page One. IF you're amongst the increasing numbers of Australians opting for seafood this Christmas Day, and you want a classic bubbly from the heartland of France's Champagne region to celebrate with it, give thought to a bottle of Champagne Taittinger's Prelude Grands Crus NV. Although it carries a $130 price tag, this is the real thing with which to reward yourself (if just once a year,) being made with equal parts of Chardonnay from the Cote des Blancs and Pinot Noir from the Montagne de Reims. Intensive fresh citrus fruit flavours coupled with suggestions of white peaches in syrup make this a perfect match with the majority of seafoods, in particular hot or cold lobster, mixed seafood platters, with the hors d'oeuvres pre the main course on Christmas Day – or to ring-in the New Year. ONE FOR LUNCH: A novel idea from South Australia's Angove Family Wines should appeal to the cooks amongst us: it's a free packet of San Remo Linguini or Risoni pasta and a recipe card from celebrated Adelaide chef Adam Swanson with every bottle of Angove's Brightlands 2008 Sauvignon Blanc Semillon and 2007 Brightlands Cabernet Merlot, that are themselves great value buying at $13.95 each. Owner of restaurants Esca and Zucca in Adelaide's Holdfast Shores precinct, Adam's recipes are for Cockles and Fennel Linguini to match the tropical overtones and racy lemon/lime flavours of the Sauvignon Blanc Semillon, and a Spiced Veal Osso Bucco with Herbed Risoni to enjoy with the black fruit flavours of the Cabernet Merlot. The free San Remo pasta packs and Adam's recipe cards are available – while stocks last, which will hopefully be until sometime into January – when you buy either of the Brightlands wines through most liquor outlets. DAVID Hook Wines have built up a nice reputation for single varietal reds and whites since being established in the Lower Hunter Valley by David and his family in the 1980s. But every now and again they break out of the mould with a blend, and one that's just been released and well worth looking is their 2008 Shiraz Viognier, with 75-per cent fruit from an excellent vintage in the Hunter, 20 per cent from Mudgee and the remaining five percent from South Australia's McLaren Vale. The individual parcels were fermented separately before blending and aging in older oak barrels for twelve months. The result is a very easy-drinking medium-bodied wine with nice red berries and spicy fruit flavours and pleasant tannins. Enjoy now at a value $25 with char-grilled lamb forequarter chops off the barbie, or put it away to further develop over the next two to four years. ONE FOR LUNCH: LONG Flat has been around for over forty years now, and with summer just around the corner their 2008 Pinot Grigio that's just been released is absolutely great buying at only $9.90 for hot-weather quaffing around the pool, or with summery chicken, turkey or seafood salads. Winemaker Shane Virgo used multiple-vineyard NSW Riverina fruit for this wine whose crisp and lively palate has dominant apple and citrus fruit flavours and a lingering pear finish. A hard one to beat for flavour and value at under $10. REGULAR readers will know that we've long advocated the enjoyment of lighter and softer reds off the ice on warmer days and balmy summer's evenings. Quite a few of makers suggest on their back-labels popping some of these reds in the fridge or in the ice-box an hour or so before opening, and Joe Grilli at Primo Estate in McLaren Vale has now gone one step further. He and fellow maker at Primo, Daniel Zuzolo have created a light 2009 red they call 'Merlesco' (Little Merlot) that's got loads of fresh blackberry, blueberry and cherry fruit flavours – and it's unoaked. This soft and fruity wine is designed to be enjoyed young, fresh and chilled, and goes especially well with pizza or pasta; and at just $15 a bottle set aside some room in the beer fridge now for a few for summer, and take Joe's advice and don't drink it from traditional wine glasses – he says it will taste even better chucked down from a glass tumbler. ONE FOR LUNCH: THIRTY years ago you could count the number of vineyards in the NSW Orange region on the fingers of one hand. Today there are 30-something wineries and cellar doors in the region that at 600m is our highest-altitude wine-growing region, and amazingly now attracts around 5000 visitors a year for its annual Orange Wine Week in October – showing they've got to be doing something right. One winery earning a particularly enviable reputation for its Chardonnay is Climbing Wines. Its just-released 2008 is full-bodied with lovely citrus notes and typical Orange elegance and refinement – the reason the region is often referred to as "Australia's answer to Burgundy," with its food-friendly Chardonnays (that go particularly well with seafoods and platters of fish paté, quality cheddars and crackers,) driving much of this reputation. WAS 2007 "the greatest red vintage ever" in Margaret River? If you listen to Evans and Tate winemaker, Matthew Byrne the answer's a resounding "Yes." Matthew says slightly warmer than usual weather was the key, and that a resultant 2007 Shiraz blended from fruit from vineyards in both the northern and southern areas of the region was "benchmark Margaret River." This elegant wine has beautiful aromas of mulberry and plum and a rich palate of dark fruit flavours and tannin ripeness; exceptional value at $22.99 to enjoy with braised lamb shanks and parsley-infused mashed potatoes. ONE FOR LUNCH: IT'S that time of year when our thoughts turn to bubbles, and reflecting their Italian heritage De Bortoli Wines have come up with something quite out of the ordinary – a sparkling Pinot Grigio. Bottled under their Emeri label – appropriately so-named after the wife of the late Deen De Bortoli, the ever-bubbly Emeri – this is a great value party-room wine for the Festive Season. At just $15 lay in a few to enjoy with Christmas canapés or to go with holiday seafoods, salads or light pasta dishes. 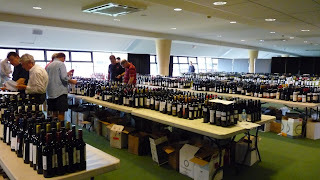 AND ONE OR FORTY TO TASTE: Join NSW's best winemakers in Sydney on Thursday October 22 for a "tour" embracing the State's 2009 Wine of the Year, Trophy Winners and it's "Top 40" Wines. Choose a guided small-group tasting tour with one of the successful "Top 40" winemakers, or simply D-I-Y; all wines will be matched to appropriate regional cheeses at this one-off opportunity to see all the wines that made the "Top 40" in 2009. SO LONG CHARDDY – BRING ON THE ’BLANC? IF you were a grower or a winemaker prepared to take a punt on a just-conducted survey of our wine-drinking habits, you'd be chopping out your Chardonnay, swooning over your Sauvignon Blanc, and planting Pinot Noir. The survey, amongst guests and diners at Mercure Hotels' 23-properties across Australia, found drinkers were turning off Chardonnay in their droves – making it the fastest-declining white variety in the popularity stakes. By comparison, sales of Sauvignon Blanc through the Mercure Groups' restaurants and bars increased 47% over the past two years, and while Shiraz was the overwhelmingly most popular red in the same period (followed closely by Cabernet blends,) the fastest-growing red wine of choice was Pinot Noir. And probably not surprisingly the survey found New Zealand Sauvignon Blanc leading the field in popularity, but with Aussie labels catching up as diners seek out local food-friendly wines – something Sauvignon Blanc certainly is. Riesling was another variety to take a hammering in the survey, and interest-ingly it was women leading the charge on Sauvignon Blanc (as well as better sparklings and lighter reds.) A majority of men still preferred reds to whites. ONE FOR LUNCH: In our own tasting of Aussie-made Sauvignon Blanc, we gave our thumbs-up for Best Value For Money to Westend's 2009 Richland from the Riverina – a nicely full-bodied and richly textured wine with loads of tropical fruit flavours, a dry crisp finish and a hard-to-beat $11.99 price tag. Best Food Match: Logan Wines' 2009 Sauvignon Blanc from Orange – plenty of zingy lime, pink grapefruit, green mango and minerality ($22;) Best Party Room SB: Wicks Estate Adelaide Hills 2009 – an $18 beauty of a quaffer with herbaceous and tropical fruit flavours; Best Value Import: The Crossing 2008 SB from New Zealand's Marlborough, an undeniable ripper at $16.99. Enjoy all these wines with shellfish, Asian stir fries or stronger cheeses. WE've long subscribed to the view that the Australian wine industry is made up of some of the world's more interesting characters who display a diversity of interests, pastimes and lifestyles not found in the Old World – where wine-making is more-largely simply handed down from father to son or daughter. Jim Wolfensohn is one such of our more unusual winemaking characters: Aussie born and raised, he spends most of his life in New York's heady world of finance, including Presidency of the World Bank from 1995 to 2005. Hardly the sort of guy you'd find getting down and dirty in a vineyard on visits home to one of our smaller winemaking areas, Hilltops. But Jim does just that at his Yabtree West grazing property near Gundagai when not in the Big Apple, and where he's mastering a few hectares of exceptional Shiraz vines. With the help of Simon Robertson whose family pioneered the Hilltops region with their Barwang vineyard, Jim Wolfensohn draws on the local rolling hills to provide reflected sunlight that harnesses the power of photosynthesis, helping grapes ripen earlier and reach full fruit maturity at a lower-than-usual sugar level – much like in Germany, France and Italy. And he called on another local, Italian-trained Joel Pizzini to make his 2007 Yabtree Shiraz that's a wonderfully European-style wine, rich with deep ruby colours and mouth-filling flavours of blackberries, black pepper and aniseed. Great $25 value with saltbush lamb, roast pheasant or wild mushroom risotto. ONE FOR LUNCH: IF you've a favourite Indian or Thai restaurant that's BYO, next time you visit take along a bottle of Logan's Orange (NSW) 2009 Weemala Gewurztraminer. This is a curry-lover's wine whose spice mirrors that of the food, while the floral lychee and passionfruit flavours complement the heat and kick of the curry, much like a fruit chutney does. At $18 this is a lovely cool-climate wine for curries and other spicy dishes. IT doesn't seem that long ago that Australian winemakers started putting the majority of their wines under screwcaps in place of cork, as they sought to eradicate cork taint and preserve wine freshness in the bottle. But while the year 2000 is generally considered the "beginning" of the trend, experiments in fact began as far back as forty years ago. And the first really concerted efforts to sell the idea of screwcaps to consumers in the 1980s and 1990s met with quite strong opposition: buyers looked on wines under the new closures as inferior products, and most makers went back to cork. But in South Australia's Clare Valley when several makers banded together to import half a million screwcaps and bottles from France to bottle their premium 2000 Rieslings, consumers suddenly appreciated the reason for screwcaps: they were in fact an assurance of longevity and bottle freshness. One of those Clare Valley makers, Peter Barry of Jim Barry wines remembers it well. "We were fed up producing some of the world's finest, most delicately and freshly flavoured Riesling, only to open bottles that had been cork-sealed and find our great wines corked, oxidised or just obviously dull," he says. "The Australian Wine Research Institute, however, found that wines under screwcaps showed the highest level of overall fruit character retention, the least development of oxidised characters, and effectively zero cork-taint. It was exactly what we were seeking; armed with this knowledge and our own research, we knew the screwcap was here to stay." Peter's tenth Clare Valley Watervale Riesling under screwcap for Jim Barry Wines, the 2009 is an almost flamboyantly-flavoured wine with beautifully forward Tahitian lime, cumquat and grapefruit flavours. At just $14.95 it is ideal now with lighter-style seafoods, chicken dishes and salads – or rest assured that under its screwcap, it will cellar well into the next decade, further developing its already apparent layers of flavours. Shiraz: Bowen Estate 2007 (SA – Coonawarra) - Jeremy Oliver gave this one 92 points and who am I to disagree? Why not slip into a comfy couch on a Friday or Saturday night and soak up the cool jazz and harbour views with a glass of Park & Joyce. Bliss! AN unseasonally cool February after moderate mid-summer conditions in the Adelaide Hills in 2008 certainly gave makers there plenty to think about, but there was worse to come in March when conditions swung from cool to one of the longest heatwaves in South Australian history. Matt O'Leary at Wolf Blass, however, managed to get all the fruit for his white wines off the vines before the heatwave hit, and because of those earlier cool conditions this fruit was flavoured to the max, resulting for him in a really outstanding 2008 Wolf Blass Gold Label Adelaide Hills Chardonnay. A very elegant wine rich with varietal Chardonnay flavours, it has a nice creamy texture, and aromas of grapefruit, white peach and subtle nutty oak. Pay $25.99 and match with a creamy seafood mornay or roast pork. And while enjoyable now, it'll develop nicely over the next three to five years for even greater pleasure down the track. ONE FOR LUNCH: NOT many wine labels take their name from supporters of the Temperance Movement, but Wynns' Alex 88 does just that. A Miss Nora Alexander lived on the land at Coonawarra that became the Alex 88 block, and as a supporter of the Women's Temperance Movement dictated that after her death, the property not be sold for growing grapes; her nephew, however, sold it to a neighbouring winery some years later, and it was later bought by Wynns. A 2006 Wynns' Alex 88 Cabernet Sauvignon (the number 88 comes about because the vineyard was planted in 1988) is a full bodied wine with beautifully forward blackberry fruit flavours, integrated oak and lingering tannins; a lovely red well worth the $38.99 price tag to share with roast lamb and garlic mash. WHEN boutique Margaret River winemaker Deep Woods released its 2007 Ebony Cabernet Shiraz last year, it was inundated with praise from consumers and wine critics alike as an outstanding wine at a great price for average consumers. It's a safe bet Deep Woods will get the same praise again this year for its just-released 2008 Ebony Cabernet Shiraz, an equally good drop as the 2007 and still priced at just $14.95 a bottle. Winemaker Travis Clydesdale drew on fruit from across the company's Margaret River vineyards to create a wine that he likes to describe as "a quintessential, juicy Margaret River red," with soft, juicy 'jube'-like fruit characters and ripe and plush tannin. Certainly it's a very quaffable, easy-drinking wine, and by giving it only minor oak treatment, Travis has allowed its lovely Cabernet and Shiraz fruit characters to take centre-stage; a beaut drop to share with pizzas or pastas. With cool winters and low average temperatures much like Champagne in France, the area's ideal for grapes to ripen slowly so the fruit develops wonderfully full flavours; the just-released Barwang 842 Tumbarumba Chardonnay (so named because the highest vineyards are at an elevation of 842m) has intense peach, rockmelon and lime flavours and excellent oak; pay $35 and enjoy with butter-brushed grilled lobster. EXCELLENT Autumn and Winter rains in 2008 and perfect ripening conditions earlier this year gave Hunter Valley makers every opportunity to create some exceptional wines from the 2009 vintage. Tintilla Estate's owner/winemaker, Robert Lusby and winemaker son James, took advantage of every aspect of this vintage, and you'll have trouble trying to find fault with their 2009 Tintilla Angus Hunter Valley Semillon. Somewhat fruitier than normal, this wine's got lovely lemon and lime flavours, good acidity and an austere finish, making it ideal to enjoy young with pasta smothered in a creamy mushroom sauce; certainly great buying at $26. ONE FOR LUNCH: Just 80 lucky diners will sit down to a degustation prepared by classic French chef, Damian Pignolet of famed Bistro Moncur in Sydney's Woollahra, with accompanying wines from cold-climate Logan Wines at Orange in the NSW Central West. A 2008 Chardonnay and a 2007 Shiraz will head-up the wine list: we're particularly wrapped in the Shiraz that's very food-friendly and almost a cross between the style of France's southern Rhone and that of Italy with its forward fruit flavours and excellent use of wood. The Damian Pignolet/Peter Logan Degustation Dinner will be held at Logan Wines' Mudgee Tasting Rooms on September 19; details (02) 6373 1333. If you can't make it, pay $25 and match up the Logan 2007 Shiraz with roast duck and baked vegies. FOR THE DIARY: The Hunter Valley's Inaugural 'Home Grown Gold' Wine Tasting will offer the first chance to taste Gold and Trophy winning wines from the 2009 Clear Image Hunter Valley Wine Show; venue is Lindeman's Wines in Pokolbin on Saturday afternoon August 29 with entry $20pp. 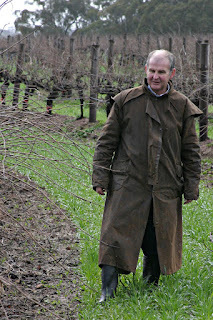 There'll also be a Wine Masterclass ($50pp;) info www.winehuntervalley.com.au or (02)4991 4533. THE Clare Valley's Kirrihill has released a new Clare Valley Regional Wines label with a Cabernet Sauvignon and a Shiraz for those looking for early-drinking, affordable reds. Inspired by winemaker Donna Stephens, who joined Kirrihill's team just in time to work the 2008 vintage, the new range draws on fruit from targeted vineyards in several of the Valley's sub-regions to showcase its renowned regional characteristics. The 2008 Kirrihill Clare Valley Cabernet Sauvignon, made jointly by Donna with side-kick Marnie Roberts, captures classic Clare plum, mulberry and dark cherry on the palate, coupled with aromas of blackcurrants and violets. Nicely priced at just $14.99, this is a real-value buy-now, drink-now red for next you chuck a steak on the barbie. So when he decided he'd have a go at planting this Alsace variety, he didn't do as most do and stick in a few experimental vines to assess their worth over several vintages: with wife Pam Goldsack and friend Grant Crawley they devoted 2ha of their Sheoaks Vineyard to Pinot Gris in 2001 – and triple this (6.5ha) in their Ladera Vineyard three years later. Their adventurous spirit has certainly paid off: the Tim Adams 2009 Pinot Gris ($23) has nice pear, peach, lychee and passionfruit flavours, and a crisp acidity, all attributes that make it ideal to share with Thai, Vietnamese and other Asian dishes that have a hint of chilli to them. PINOT Gris is a relatively new variety to be planted in Tasmania, but the island State's cool-climate winemakers are showing they are up there with the best in handling this delightful and increasingly popular grape. Bay of Fires, whose winemaker Fran Austin is crafting some really exceptional wines from a number of classic varieties the company is having plenty of success with, has just released a 2008 Pinot Gris that's sure to prove a hit with those turning towards this very versatile food-match wine. Using fruit from across various areas of Tasmania's vineyard regions, Fran has turned out a more-ish wine with classic Pinot Gris pear, citrus and spice flavours. Pay $28.50 and enjoy with a wide range of Asian pork or chicken dishes, or with Atlantic salmon steaks topped with a sprinkling of mixed herbs. ONE FOR LUNCH: Senior winemaker at Coonawarra's Katnook Estate, Wayne Stehbens is being pretty modest when he says 2006 was such a great vintage that wines that came out of it were "almost self-made." He should mention also that he's got a more-than-average handle on the place: he's been making wine there for Katnook for 30 years. The 2006 vintage in Coonawarra was a very early one with slightly above-average temperatures during summer and extending into the ripening period, so that the low-yielding vines had loads of flavour. Wayne's 2006 Cabernet Sauvignon is one of his best: elegant and generously flavoured with rich dark berry, sweet oak and fine grained tannins. Pay $40 and enjoy with prime rib and a Bordelaise sauce whose peppercorn, shallot and thyme flavours will match this wine perfectly. THERE'S nothing new about making wine in the Canberra Region – they've been doing it for 180 years. What is new – in the sense of the last ten or twelve years – is the exquisite quality today of some of those wines: owners of over 140 vineyards have worked hard to coax the best from their cool-climate vines, and some thirty-three wineries have worked equally hard to extract the best from that fruit. One such drop is Ravensworth Wines' 2008 Riesling that's got lovely gentle apple and lime flavours, a hint of lemon and a touch of minerality that's crisp and more-ish; pay a good-value $18 for this wine and enjoy with your favourite seafoods. NEIGHOURING Hilltops around the NSW town of Young is another of our smaller regions that's coming up with plenty of nice surprises. Chalkers Crossing have created some really excellent wines here, and one worth searching out is their full-bodied 2006 Hilltops Cabernet Sauvignon: complex red-berry flavours and fine tannins are coupled with accompanying fresh cassis, blackcurrant and mint aromas. Don't look past this now at $24.99 to enjoy with gamey meat dishes or a platter of strong cheeses – or put aside for greater enjoyment in eight or nine years. THESE two wines, incidentally, are amongst thirty from six makers that will feature at an interesting "By the Dozen Top 6" Canberra and Hilltops tasting in Sydney's The Rocks on the evening of July 30th. The 30 wines were chosen by "Top 6" founders David and Veronica Webster who tasted dozens from the two regions and will discuss their reasons for choosing their "Top 6" makers' final 30; cost is $25pp that's redeemable against orders of $240 or over. Book at wine@bythedozen.com.au – and ask about future "Top 6" tastings from Hunter Valley and Tasmanian makers.